I try to be a neat person, but with a full time job, and a garden that’s half an acre, somethings gotta give. 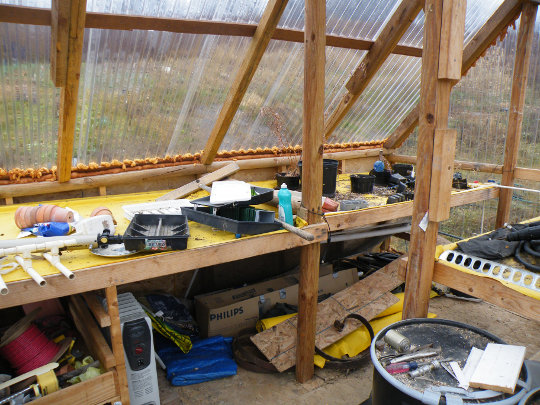 That something this year is the tidiness of the greenhouse. I’ve started over a thousand plants in this space this spring, and used the building as a shed since then. In 2011, I plan to start about 100 tomato plants, and 200 peppers, quite a few less then last year. I’ll increase the number of Cucumber plants, and start new crops such as Pak Choi, Celery, Lettuce, and others. However, that plan will never work out if I don’t clean up my mess. I’ve got to clean off the shelves, tear out the small chicken pen on the right hand side, and organize things so this type of mess is hard to duplicate in the future. After a few hours of organizing, and throwing away things I won’t use again, I was left with nearly clean shelves. I still have a small pile of dust on each table to clean up. If I could find my dust pan, this picture would be much more complete, but I guess that highlights the next project that needs care: organizing my home. Right Hand Side Neat and Organized. 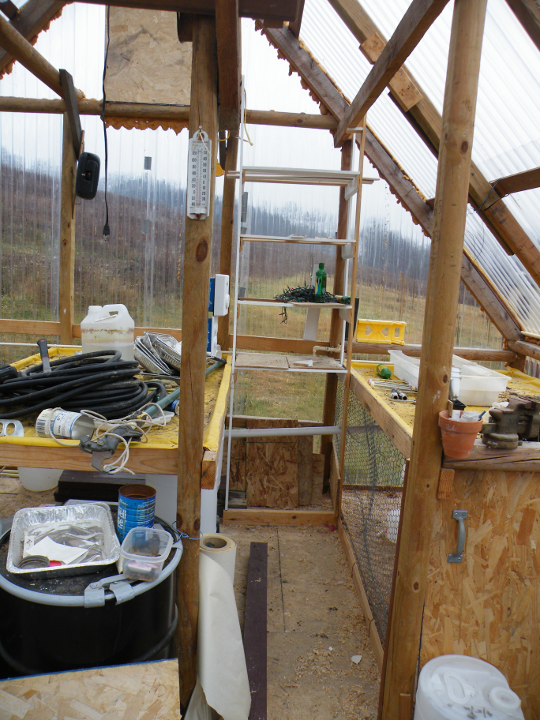 I’ve managed to remove the small chick coop I had under the right most water table. Sweeping the floor was a bit of a chore, with dust flying everywhere. 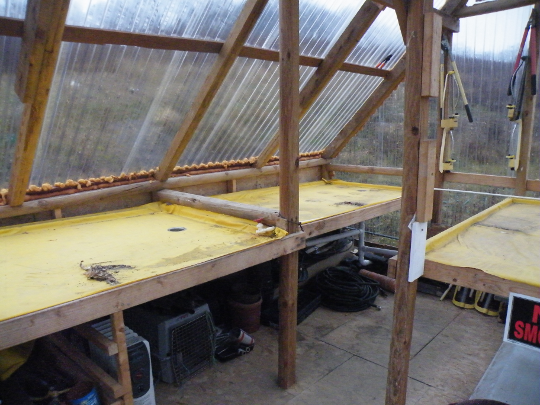 I’ve also moved the water barrels to the side of the greenhouse which receives the most light. This should help increase the amount of Solar heat which is stored, and it makes the room seem larger. 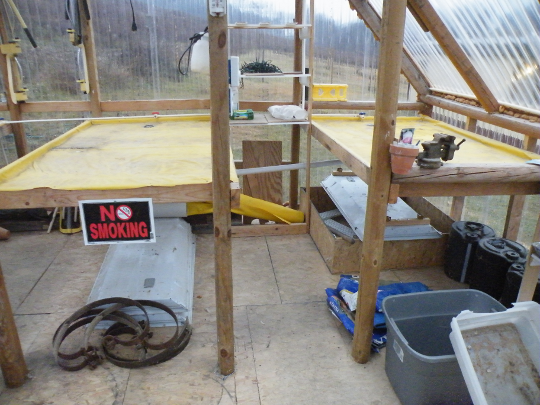 I may add some shelves in front of the center water table, not for my own plants, but for others who have suggested increasing the output of this structure. I’ve also considered a way to add shelves into the peak area to maximize space usage. I imagine I could use a pulley system to hoist a set of shelves up into the peak area, so they won’t compete much for the suns rays, or the little space for walking. Good job! How did you like having the chickens in there? It was a terrible idea, and left dust everywhere. Many of my tomato seedlings seemed to be stunted by the dust the chickens generated. I’m gonna try it this winter but I’m putting them in the back and make a makeshift wall and back door. I can’t handle the dust myself ….it closes my throat right up but I want them to have a warm place in the winter. Nice blog. Nice greenhouse. The barn work was nice too. Your a handy guy.! I added a link to your blog as well.